The odds that Osama bin Laden was the mysterious figure seen walking around the compound in Abbottabad, Pakistan were estimated by U.S. intelligence at between 60 and 80 percent. When the Navy SEALs shot the tall figure on the upper floor of the compound, fatally hitting him in the chest and near his right eye, the next step was to get a positive ID. They planned to use several reference points, including facial recognition and eventually DNA when the body was transported back to Bagram airbasein Afghanistan. Another measurement was to determine the height of the corpse. Bin Laden is listed on his FBI most wanted poster as being between 6-feet 4-inches and 6-feet 6-inches and weighing about 160 pounds. However, the heavily-armed, electronically wired SEALs didn't come with a tape measure to get an accurate height reading. 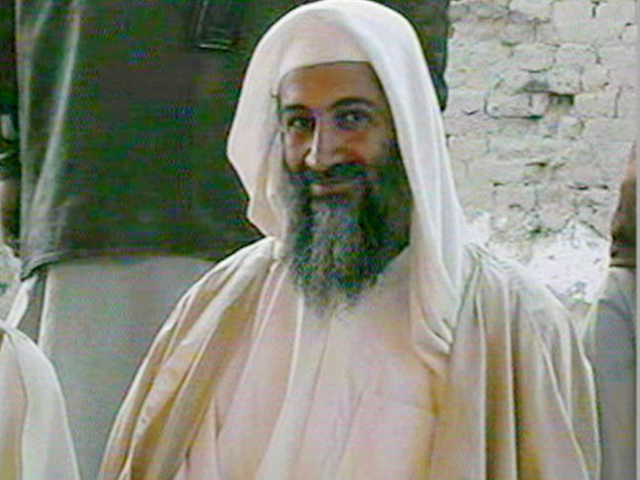 According to reports, a Navy SEAL of about 6-feet laid out next to bin Laden's corpse to gauge the Al Qaeda leader's height. The corpse was several inches taller. The Washington Post's legendary reporter Bob Woodward came up with some inside the Situation Room conversation while the raid was underway and the president and his team were watching a muted feed of the action. After Mr. Obama learned of the improvised height measurement technique, he reportedly said, "We donated a $60 million helicopter to this operation. Could we not afford to buy a tape measure?" The helicopter in his remark was the stealth technology-outfitted bird that crash-landed as the raid began and had to be destroyed by the SEALs. Woodward also learned that bin Laden was named "the Pacer" as the intelligence gathering proceeded. Satellite imagery showed a person walking in the compound daily, but the face and exact height of the pacer were not identifiable. In addition, Woodward learned some specifics about the phone call by the courier Abu Ahmed al-Kuwaiti that led U.S. intelligence to bin Laden's Abbottabad lair. Speaking to a friend as the U.S. was recording the conversation, al-Kuwaiti said, "I'm back with the people I was with before."